Implementing a disability studies and cultural studies framework, this paper offers a critical analysis of the two popular science fiction films: Lucy (Besson, 2014) and Her (Jonze, 2013). In both films, Scarlett Johansson plays the leading female character. In Lucy, the protagonist is a human being who experiences radical transformation due to an overdose of a new kind of drug, while in Her, Samantha is an operating system designed to evolve. Despite their clear differences, Lucy and Samantha share a similar destiny. Eventually, both of these figures develop into a super-able consciousness that continues to evolve beyond the restrictions of the physical world. 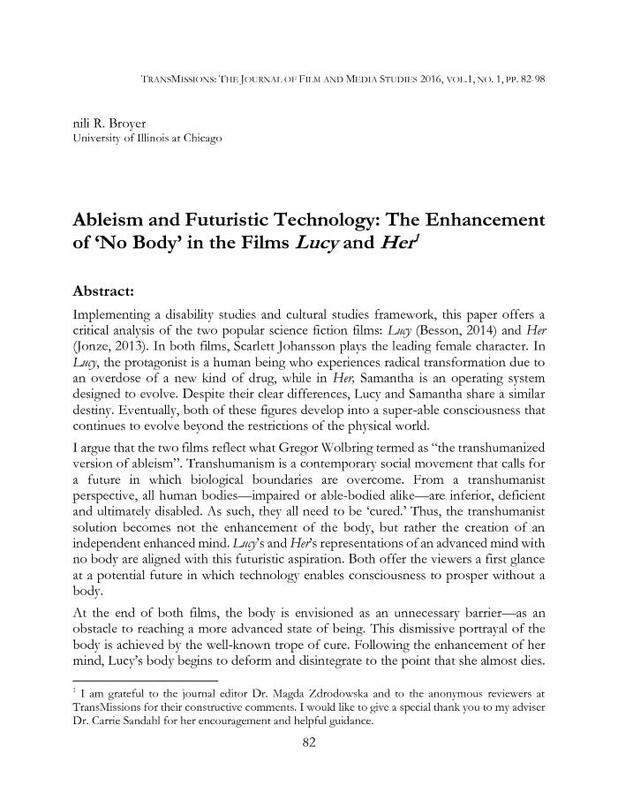 I argue that the two films reflect what Gregor Wolbring termed as “the transhumanized version of ableism”. Transhumanism is a contemporary social movement that calls for a future in which biological boundaries are overcome. From a transhumanist perspective, all human bodies—impaired or able-bodied alike—are inferior, deficient and ultimately disabled. As such, they all need to be ‘cured.’ Thus, the transhumanist solution becomes not the enhancement of the body, but rather the creation of an independent enhanced mind. Lucy’s and Her’s representations of an advanced mind with no body are aligned with this futuristic aspiration. Both offer the viewers a first glance at a potential future in which technology enables consciousness to prosper without a body. At the end of both films, the body is envisioned as an unnecessary barrier—as an obstacle to reaching a more advanced state of being. This dismissive portrayal of the body is achieved by the well-known trope of cure. Following the enhancement of her mind, Lucy’s body begins to deform and disintegrate to the point that she almost dies. By absorbing more doses of the drug, her mind succeeds in overcoming her body and eventually Lucy is ‘cured’ from its restrictions. On the other hand, Samantha cannot be considered a real human being. This ‘disabling’ state is resolved by her ongoing growth and change of attitude. Finally, Samantha is ‘cured’ and proved superior to flesh and blood human beings. These ‘ultra-cure’ narratives are recognized by me to be part of a fundamental long-lasting ableist western ideology and an integral part of the Eugenic doctrine. Her - What Are You Doing?